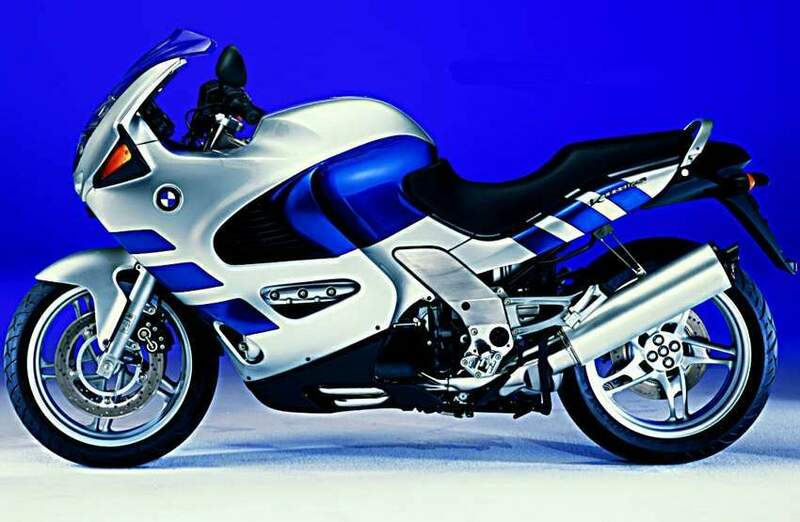 Text I get asked a lot about what I think of BMW's K1200RS. On paper, the big K has it all down pat: shaft drive paralever rear suspension to quell throttle induced rise and fall; telelever front suspension to cure any dive induced by the dual four piston Brembos; wide, grippie, low profile radial tires; and a whopping 130 horse power, nearly twice that available to the K75 rider. One was almost tempted to overlook the 638 pound curb weight and the quirkie BMW styling that, like the K75S, eventually grows on you to the point where other full faired machines look odd. A first test ride brought one aspect of this bike into startling focus: the 1200cc horizontal four is a monster! So much so that the characteristics of the motor completely dominate the overall personality of the motorcycle. Its as if there were a wire from the throttle to the back wheel, and any change in throttle position is instantly translated to a change in wheel rpm. Grab a handful in any of the first 4 gears and there is no delay in the engine reaching the specified RPM. No monkey business, no messing about lofting the front wheel, no rear wheel spin, no delay. Just hard, direct, squeeze-the-tank-with-your-knees-and-hang-on-tight acceleration. Just as the motor is capable of flattening eyeballs on launch, so too are the brakes capable of bugging eyeballs when needed. Like Will Smith in Independence Day, my only thought was "I gotta get me one a these!" Ah, but the perspective of my advancing years allowed me to look beyond the joys of wringing the beast's neck. After coming back to my senses from the rush of acceleration, it didn't take long to realize that my knees were in my armpits and I was almost doing a handstand to reach the bars. BMW had pitched the RS squarely at the Sport side of the Sport Touring market, and while I like a sweet set of bends as much as the next rider, I've been around long enough to know that the sweetest twisties are often separated by long stretches of fairly boring twolane or, even worse, interstate. And with hours of mountain biking and keyboarding taking an increasingly severe toll on my carpal tunnels, there was just no way I could do the trips I fancied on the factory issue K12. Thus began a wait that was to end only after ways were developed to move the bars up and back. 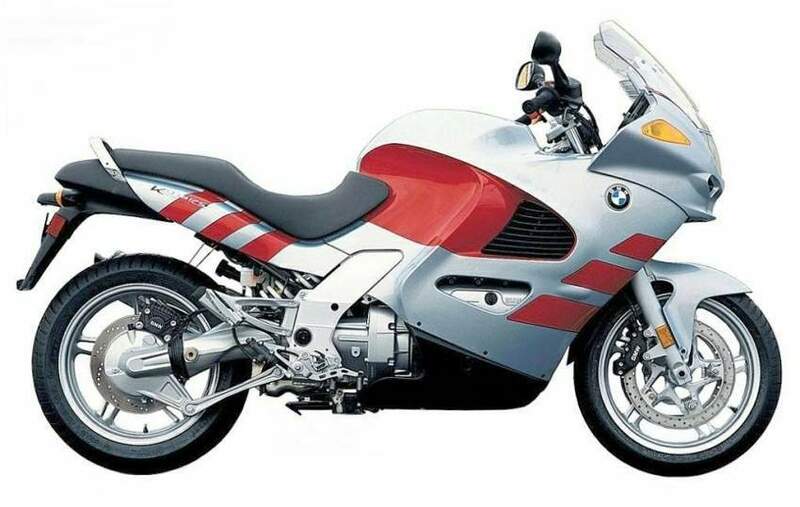 By the Spring of 1999, both BMW and the aftermarket had fielded several options that provided a softer edged riding position, and it wasn't long before a suitable machine was located (via Internet, of course) on the used market. With the addition of BMW's Comfort Kit, the bars move to a more manageable position, avoiding the unsightly bracketry found with the aftermarket bits. The Comfort Kit bracket (left) moves the bar up and back in the same plane as the stock BMW bar mount (right with an aftermarket bracket installed). The aftermarket brackets also move the bars back, but as the photo shows, the bar is moved a good deal up as well. Neither approach requires changing brake hoses or readjusting throttle cables. The result is still a very sporting position, more so even than the K75S, but it is manageable over long untwisting distances. In the long-term-daily-living-with-it vein, there is a lot to like about the RS. Apparently BMW was listening when folks complained about K bike mannerisms, since so many of the classic niggles are gone. Its actually easier to put the K12 onto the center stand than it ever was with the K75. And BMW's focus on isolating the engine from the frame results in a motorcycle that is almost totally free of vibration in bars, pegs, seat or, most importantly, mirrors. At certain RPMs there is no vibration, and when combined with a suitable set of twisties, the resulting sensation is as close to flying as I've ever experienced without actually losing contact with the ground, or dreaming. Fortunately the Brembo brakes are easily capable of hauling down a euphoric rider's speed when the inevitable decreasing radius corner or lame brained motorist is encountered. All without upsetting the composure of either machine or rider: no diving, bobbing, weaving, or other unsettling sensations present themselves. There's even an ABS system to moderate over enthusiastic lever pressure. When temperatures soar into triple digits, the RS fairing ducts engine heat away from the rider, eliminating blistered inner thighs and scorched shins common to the earlier K models. If the handlebars are a reach for an average sized person, the adjustable seat makes it easy for this 31 inch inseamed rider to flatfoot the bike at stoplights. Electric grips are a welcome addition, and now the rubber is both round and comfortably compliant. Mirrors provide a sharp, clear view of the road behind, and are un-blurred at all RPMs. There's no choke lever: Starting is as simple as twisting the key and punching the starter. Also missing is the clutch cable, replaced with a hydraulic line and reservoir. Instruments are large, easy-to-read analog units with black faces and white needles and numbers. Tach and speedo dominate the panel, with smaller water temperature and fuel gages mounted outboard. A bank of idiot lights track ABS, high beam, turn signals, transmission neutral, low fuel, oil pressure, and alternator output. The sole digital gage is the clock, which displays its hours in standard 12 hour format. Headlight adjustment is a snap thanks to large levers and knobs that move the reflector behind the lens. Equally compliant is the fairing belly pan, which is composed of flexible black plastic, left unpainted to better endure the slings and arrows of its wheel chasing location. And when it comes time to check-in at days end, the integrated saddlebags unlock with the same key that works the ignition lock and releases the seat. The ignition switch also incorporates a fork lock which can be engaged at either right or left steering lock. Like any engineering endeavor, hower, the K12RS is a compromise. It seems the folks that were so busy flogging BMW with earlier K flaws neglected to pass along the good features that should be preserved. Gone is the under seat storage that on earlier BMWs was big enough for a rain suit, bulb kit, and factory tool roll augmented with aftermarket goodies like ViceGrips and extra CO2 cylinders. Under this K's seat there's barely enough room for the tool kit, owner's manual, and rubber funnel. Rubber funnel, you ask? Seems the stylists won the argument over the oil filler port location, which is now positioned on the vertical surface of the crankshaft cover. Since few oil bottles come with long built-in spouts, BMW sells a collapsible rubber funnel to direct oil from bottle to crankcase. The sole consolation here is that the funnel fits under the seat in the space above the tail light, one of few items flexible enough to do so. Ah, and what a seat! BMW has a long history of providing saddles that owners immediately replace. Indeed Mike Corbin started his fortune from the early K models. That tradition continues here, but its hard to pinpoint just where the problem lies. Perhaps its the acute folding of the rider's legs that puts more pressure on the sit bones. Maybe its foam that's a bit firmer than needed. Whatever the reason, a couple of hours will have you squirming, with one-cheek-sneaks and lycra shorts providing little relief. Mr. Corbin's not much help either: $600 will get you a new, nonadjustable replacement, but I haven't heard one way or the other whether it provides an answer. After two hours though, you'll be looking for both a gas station and some relief for your throttle hand. The big K motor guzzles premium gas at a healthy rate, ranging from a high of 42 mpg at sub-speedlimit drones, to low 30s on Kalifornia's near-gas when running at a more sporting pace. With only a little more than 5 gallons of capacity, range can be as little as 150 miles before the pushing starts. The throttle is built with springs salvaged from kodiak bear traps, and wraps from closed to WFO in a mere quarter turn. "Wrist Rest" and "Throttlemeister" type "cruise controls" that apply friction to the end of the grip don't work well on the RS: Only moderate changes in temperature (as in sunshine) is enough to cause the grip to lengthen or shrink, and the device needs constant adjustment to keep the throttle open when the grip is released. I haven't found a "Vista-Cruise" type control that will fit, and the "Flip-a-Lever" isn't made for the K12. When the quick turn throttle is combined with the motor's braun, its best to avoid anything over 3000 RPM when tooling around town. At higher revs every bump or slight throttle movement will have the machine lurching back and forth like a bucking bronc. While the full fairing proves visually interesting, it provides a less than ideal living room for the long distance rider. The worst offender is the adjustable windscreen. In its lower position it directs air at the bottom of this 5'10" rider's helmet, creating a roar very reminiscent of the K75S. When raised, air buffets the eyeport hard enough to jostle a head to and fro. Only at speeds over 90 mph does the windscreen work well, with the full upright position the only way to survive excursions over 140 mph without having to lever your head from deep between your shoulders. 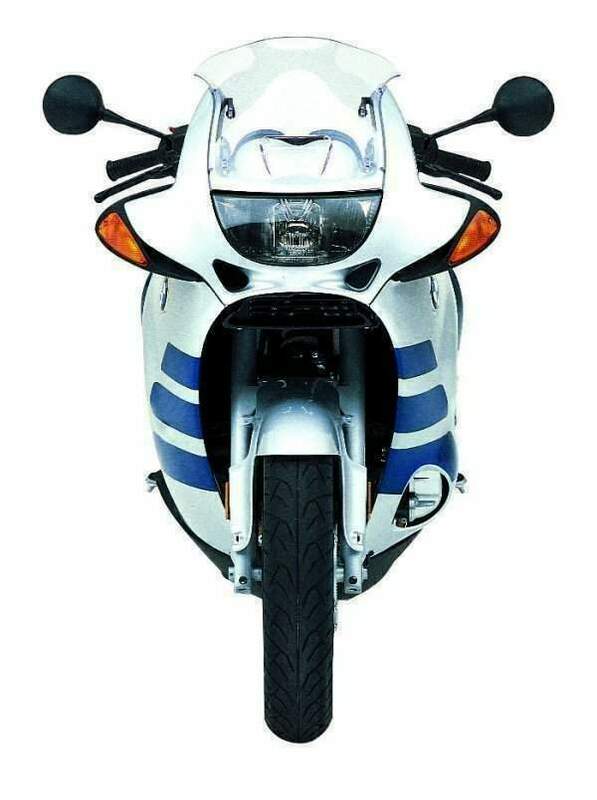 The upper fairing will give fair protection to a rider's shoulders and mid section, but leaves arms to fend for themselves. Fairing lowers provide good shelter for thighs and shins, but gone is the sometimes welcome, sometimes hated engine heat on your feet. The stylists strike again with the location of the turnsignal pods come wind deflectors, which are positioned too low to provide adequate wind/rain protection for your hands. The RS offers nothing but cool air for your tootsies, which is nice on a summer day but a real problem when the thermometer dives. Unlike the K75S, there's no comfort to be found on the passenger pegs, which on the smaller bike basked in radiator warmed air. In a bike if this size, complexity, and cost, adjustable ducts in the foot area are not too much to ask. BMW was one of the first manufacturers to offer saddlebags with integrated mounting for hassle free transport of touring and camping gear. The RS continues in that tradition, but the theme of self sufficiency and independence is compromised by the miserly capacity of the bags. Both mount higher than bags on other BMWs, and are spaced well out from the machine's centerline, extending well beyond the wide handlebars. With a setup like this lane splitting becomes a challenging, pucker prone, affair. The left bag is pierced by the muffler, which takes a quarter round chunk out of the lower right corner. A heat shield provides some protection from the muffler's heat, but the inner bag is still prone to warpage. I've been told there is a revised left side bag and mount available that provides more clearance by moving the bag even further outward and taking an even bigger bite. The latching system takes the top 1 1/2" of interior space in both bags, and violating this zone with clothing or cargo will prevent the lid from latching. The locking system itself is a mixed blessing: What at first appears to be a single handle on the top of each bag turns out to be two handles stacked one above the other. Insert the key, rotate to the unlocked position, and swing the top handle up to remove the bag form the bike. To remove the key at this point you must rotate it to the locked position, making it impossible to open the bag with the lower handle without first reinserting the key and unlocking. To open the bag while it is still attached to the bike, you insert and rotate the key, then lift both handles simultaneously. This frees the bag lid to open, but also unhooks the bag from the mounting bracket, making it very easy to knock the bag off without intending to. When the upper handle is open and the key is out of the lock, a fluorescent orange tab is visible in the path of the handle, a reminder that the bag must be unlocked before it can be reattached to the bike or opened. Attempting to close the handle on the tab can crack it, so its best to look at what you are doing. Of course, the bright coloring isn't much help at night. BMW limits weight in each bag to 22 pounds. Unfortunately I've found that somewhat less than this weight is enough to cause the bags and mounts to flex enough to allow the lower mount to disengage, especially when the bike hits a bump hard. The bag may stay on, at least for a while, but will eventually part company with the bike. If just the lower mount disengages, the bag will pivot on the upper mounts and rub on the tire. It doesn't take much of this to cause a hole to appear in the inner shell. About the only good things to say about the locking system are that it is now impossible to ride away with the both bag lids and attachments unlocked, and one key works everything on the bike. Luggage capacity is supplemented on the K12RS by an optional luggage rack and rack adapter. The luggage rack is a sandwich sized bracket that mounts to the rear of the grab rail behind the seat. It offers only marginal support to sleeping or duffle bags, but does look quite stylish. The rack adapter mounts to the rack with locking fingers on its plastic underside and provides almost twice the width of the rack alone. An optional lock is available for the adapter, and it can be keyed to match the rest of the bike for an extra charge. Maintaining the beast will prove challenging on technical, financial, and psychological levels. Like most things German, there is but one way to do things, and the $120 shop manual often leaves the reader guessing. The turn signal pods are a case in point. The manual instructs the mechanic to support the pod from below and strike the outer end with a downward blow from the heel of the hand to remove it. Unfortunately the mounting system proves to be brittle and poorly executed, and following these instructions will have the spring fingers of the retainers breaking and the split rings disappearing into the darkest reaches of lost motorcycle part land. You'll be taking off the pods frequently, since even simple maintenance tasks like changing the air filter, spark plugs, or fuel filter require removal of both the pods and the expansive, screw encrusted fairing side panels. Be careful with that ax, Eugene, since a single panel retails for over $1500. Even spark plugs for this beast don't come cheap, and a set of four will set you back at least $30. Like previous K models, the same-sized oil filter is accessed through a trap door in the oil sump. In fact, the oil drain plug crush washer and trap door o-ring are the same, too. Unlike the K75S, which required removal of only two screws to drop the fairing belly pan, the K12's takes 11 fasteners of two different sizes. A wise investment is a set of Bondhus Ball Driver allen wrenches, the ones with the screwdriver-like handles that will work at an angle. You'll become particularly attached to the 3 mm size, which fits the pan head socket screws that secure most of the fairing. BMW specifies no less than three different manufacturers for tires, and other companies make tires that they say will fit. You'll get lots of opportunities to experiment with tire brands owing to the frequent replacement intervals mandated by a sporting riding style. Metzler MEZ4 rears will go about 7000 miles, with the fronts lasting maybe 7500. Dunlop, Pirelli, and Bridgestone offer suitable skins, with reported replacement intervals from 5000 to 10000 miles. The K1200RS owner should be aware of several recalls and retrofit programs available from the dealer. Very early on BMW found that the cooling fans were not up to snuff, and went through two campaigns to replace them. Fans with a white dot are first generation, blue dot second generation and blue & white dots, third generation. Current BMW policy is to replace only defective fans. More recently, the gasket beneath the fuel pump was found lacking, necessitating replacement with a thicker version. Bikes with exceptionally tweaked fuel tank mating surfaces have benefited from tank replacement. The left saddlebag mount allows the muffler to overheat and warp the left inner bag shell. There are unconfirmed reports that a replacement bag mount is available to reposition the bag, and that the shell can be replaced under warranty. Late in 1999 BMW offered a replacement program for the aluminum muffler canister, which is easily and permanently stained by asphalt and other commonly encountered debris. The new canister is chromed steel and is available through May of 2000. 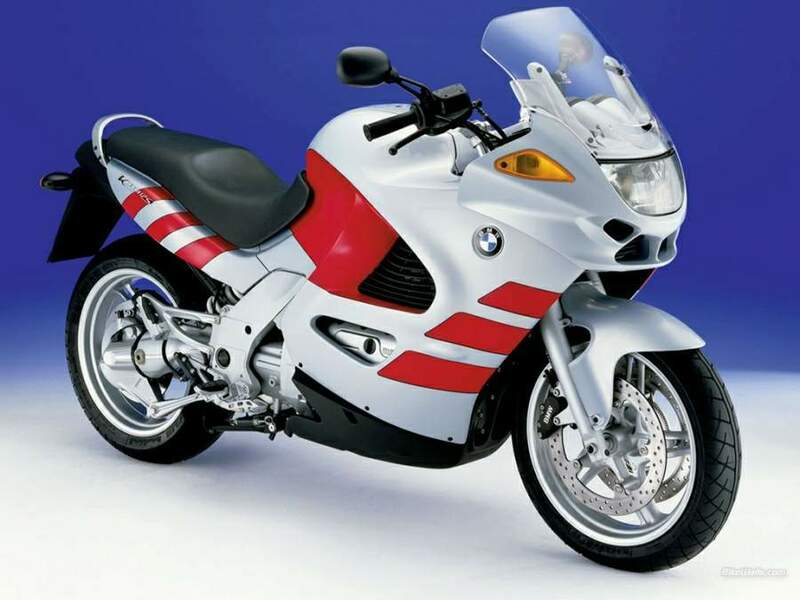 Toward the end of 2000, BMW issued recalls for the cylinder head freeze plugs and oil pump housings on early K1200RS bikes.